I am not talking about some Ponzi Schemes to double your money overnight. I am talking about genuine schemes that are legal as well as are running from past few decades. But let me tell you first, there is no sure shot way of doubling money quickly. It requires immense knowledge of capital market like Rakesh JhunJhunwala or patience for long term. Here I am going to elaborate long-term money doubling schemes. Before we proceed you should first learn about the Thumb Rule 72. What is Thumb Rule 72? The time period to double your money at given rate of return. The rate of return at which your money will be double at given time-period. Suppose you wish to invest in Bank Fixed Deposit at interest rate of 8% p.a. than according to Rule 72 your invested money will be doubled in 72/8 = 9 years. This means if you invest Rs.1 lakh in Bank Fixed today than you will get Rs.2 lakhs if you stay invested for 9 years. Similar, if you wish to double your money say in 5 years than you will have to invest money at the rate of 72/5 = 14.40% p.a. to achieve your target. This means if you have Rs.1 lakh and you would need Rs.2 lakhs in 5 years than you will have to invest it in the financial products which gives you return at 14.40% per annum to achieve your target. Though Rule 72 gives you rough estimates but it becomes very handy at the time when you have no access to calculator or do not know much about compounding or discounting. Tax-Free Bonds are not issued every year. But fortunately this year Government has granted permission to seven state run entities to issue tax-free bonds amount to Rs.40,000 crore. We have already witnessed high demand of tax-free bonds issued by PFC and NTPC and there are plenty more in the pipeline. Coupon Rate offered by tax-free bonds for 2015 series is around 8.20% to 8.50% per annum (Tax-Adjusted Return) depending on the tenure. So if you invest in one of these tax-free bonds you can double your money in approx. 8 to 9 years. 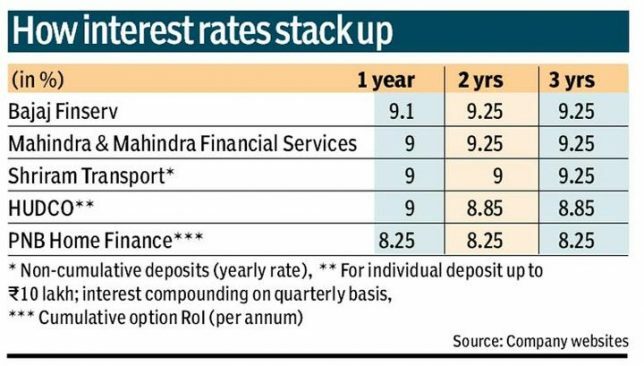 In the current scenario of rate cuts by RBI, many investors are looking for better investment avenues and whose risk appetite is bigger invests in Corporate Deposits. Since Corporates and NBFCs do not enjoy RBI backing like banks, the interest rates offered by them are quite high as compared to bank fixed deposits. Point to note is that NCDs are issued both by Companies including NBFCs while corporate deposits are only issued by Companies. NCDs and Corporate Deposits give rate of return of around 9% to 10% per annum depending on the tenure and their CRISIL or ICRA ratings. Thus investing in these would get your money doubled in approx. 8 years. National Savings Certificates are issued by Postal Department of India and are considered one of the safest investment avenues. NSCs come with a fixed interest rate and fixed tenure i.e. for 5 years and 10 years. No TDS would be deducted on the maturity amount and also you would get tax-deduction up to Rs.1.50 lakhs u/s 80C. In addition, NSCs could be used as a collateral security to get loan from banks. The interest rates offered by 5 years NSCs is 8.50% p.a. while 8.80% p.a. for 10 years NSC. Since both rate of return and time period is fixed under NSCs there is no need to use rule 72 and the returns would be Rs.1,516.2 for Rs.1,000 invested in 5 years NSC and Rs.2,366 for Rs.1,000 invested in 10 years NSC. Kisan Vikas Patra was abolished in 2012 but reintroduced in the current financial year. The reason for discontinuance of KVP was no check on the source of income for buying KVP. People used to buy KVP in cash (black money) and after the maturity the black money turns into white money. There was no requirement of the PAN and anyone with cash could buy KVP from Post-Office. Thus KVP was mainly used to turn black money into white. This loophole has been done away with while reintroducing KVP, now every investor buying KVP in cash of Rs.50,000 or more has to mandatorily furnish his/her PAN number. Currently KVP is offering interest rate of 8.70% p.a. which results in money doubling in 100 months i.e. 8 years and 4 months. Public Provident Fund is the second most popular scheme of Government after Employee Provident Fund Scheme. PPF enables every class of earner i.e. self-employed, salaried or even government employee to save and invest as low as Rs.500 per annum. PPF is one of the safest and most trusted scheme having minimum contribution of Rs.500 per year and a lock-in period of 15 years. Rate of Return are fixed each year by Government and remain effective for that fiscal year. For the financial year 2015-16, applicable rate of return is 8.75% p.a. which translates into money doubling in 8 years 3 months. Since the lock-in period of PPF is 15 years your money gets multiple folds at the time of maturity. No matter where market goes or how much RBI cut rate, Bank Fixed Deposit always remains the first choice of every Indian investor. There are many cons and pros of investing in fixed deposit. Such as fixed deposit up to Rs.1 lakh is insured by RBI while the returns after tax may not beat inflation. But still for short term period bank fixed deposits are preferred over other investment options. After the recent rate cut of 50 bps (0.50%) by RBI, almost all banks have reduced the interest rate on FD either by 0.25% or 0.50% p.a. Currently FD interest rates varies between 8% to 9% p.a. So to double money by investing in bank fixed deposit would take 8 years to 9 years. Read: How Bank Fixed Deposit may earn you Negative Returns? Investor who is willing to take little risk may choose mutual funds to earn better returns. There are varied types of mutual funds namely equity oriented, debt oriented, ELSS, Balanced or Hybrid Mutual Funds etc. Each type of fund has its own pros and cons and may not be suitable for every investor. Such as if you are investing for your child education and have enough time of 15 to 18 years than you can go with equity oriented funds but if you are looking for short term financial goal like accumulating money for down payment of your dream house than you should go with debt oriented fund. Likewise if you are a new investor and want to dip your fingers into stock market than it would be wise to start with balanced funds as it would give you experience of both debt and equity instruments. Returns of mutual funds varied from fund to fund and the tenure you choose to invest. 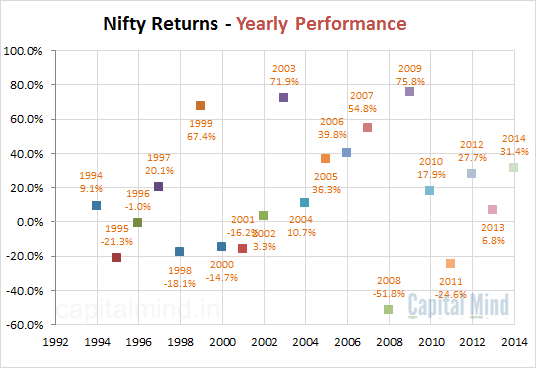 But if we go by the normal perception, in long term mutual funds tends to give return of 12% to 15% p.a. Thus you can double your money by choosing mutual fund route in approx. 5 years to 6 years. ?High Risk High Reward?, those who believe on this statement is definitely indulged in stock market. There is no certainty of return in stock market. You can earn as much as multifold returns in a years? time or can run out of money in months? time. Investing or trading in stock market needs both technical as well as fundamental knowledge. Love for the Gold is irresistible for Indian. Not only women are attracted towards its glitter but men also inclined towards it. In India, Gold is not only considered as an investment avenue but it is also given as a gift at the time of wedding. Gold is symbol of wealth and we Indian tend to collect it throughout our life. 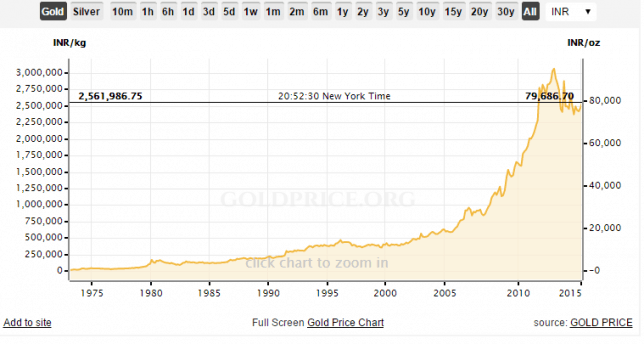 Though the returns of gold are highly volatile but still it manages to give CAGR of 22% over past 5 years. This translates the doubling of invested money in 3 years to 4 years. 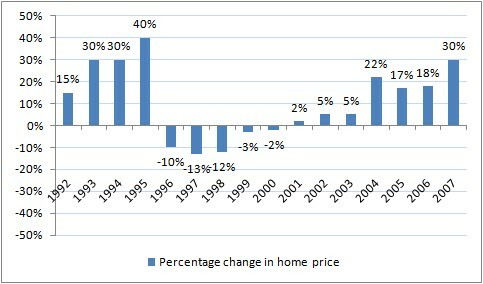 Real Estate investment is not everyone?s cup of tea. It requires huge capital to invest to generate a considerable return. Since tracking average return of real estate is not possible I have considered example of Gurgaon which has become the hub of industries from a small village. If you have invested in Rs.2 lakh in Gurgaon in 1980, it would have resulted in Rs.2 crore now i.e. CAGR of 15% over 34 years. Though investment in real estate looks too alluring but it requires pretty long time period for a hefty returns. Taking a return of 15% p.a. we can calculate that money gets doubled in just 5 years but it may not be correct because the returns are totally depend on demand and supply. Place like Mumbai has become the hub while on the other side Nashik and other cities close to Mumbai has nowhere near. Sir,I am govt Retd employee. I want to invest Rs 15 lakh of my retirement fund.I can’t take risk.Which is the best scheme of P.O. or bank ? Please also tell ..are NSC’S better for me? Interest is taxable or not? Invest 30,000 and get 4000 return for 20 times. I’m also an investor, invested on Bike taxi so I’m suggesting this opportunity.. Here u need not to have any bike nor keep any driver or put petrol everything will be taken care by the Company only including all expenses..
It’s a 12 months contract between company & us.. Every month u will receive ur amount from company directly into ur bank account..
Company also provides u an online account where everything will be mentioned.. Yes we shouldn’t invest blindly but can v have any business without risk apart from keeping money in bank or on property..?? All business is a race where we have to identify & make money when their is a possibility.. If anybody interested kindly write or call me in below contacts, Tnx..
Sir can you brief about this bike taxi business . In bad market days invest in equities n mutual funds. In staggered manner when market stabilises ..do more investment s. Equity related mutual funds gave me good returns in past. Equity holding is giving me steady earning too! If u r getting 30% then elaborate it properly. I can get you 30% in a year, So if you are ready to invest 2,00,000 for 2 years you can get 3,20,000. If interested please whats app on 9886311127. If you want to double your money in 2 years with minimum investment then contact me at 7978162080.
hows it possible tell me? if anybody interested to invest in Bike Taxi kindly call, its a real model of business running..
Business opportunity also available with investment..
Do not miss this golden opportunity..
for more and detail information pls call on 7892601384 or write to me..
Is it true. How about my money safety ? I also dont believe as it’s hard to believe and what about money safety? It must be Fake model. Rent is fine but why and how will they survive if they paid monthly reimbursement amount Rs. 5175 / bike – taxi. I want my money to double in 2years how is it possible? My investment limit is upto one lac. I need 30k per month. What is the best way to invest ? Where and When ? You can invest around 4 lakh to get 30k monthly..
Hi Sanyam, Any reason you are not updating the blog these days ? namaste, any body interested to invest in films pls do contact me.. .
Hello Ramesh If u want to invest in Film ? Production Studio with a handsome profit life long do contact me at 7233833233.
if i invest 2lacks in 2.5 years how much i will get after 3 years. i want to study for MBA , after 3 years . i am doing BA 1year and also doing job in a company . i am 18.3 years old . so please suggest me about this. Start with SIP and a small amount of lumpsum Mutual fund and then you can move to Portfolio management services. Invest in Gods work Lord Jesus Say, Love your Neighbor and enemy like your body . i surely give you guaranty your money will be 100 time dabble . Hi Ananth, please do your due diligence before investing anywhere. Most of the alternate investment options fail and its best not to share your financial details with people here. I am interested in investment. Kindly guide me. Explain me more about this, risk factors, solid proofs, if not satisfied in between, etc .. The better way to invest is on education sectors, there your money will be increasing and also it will be safe. If any any person investment mony in business I have different-different types business Plan. How much Amount needed to invested?? U can invest your money in health sector…if u r intrested to invest in health sector then contact me at this no. The article first looked like a click bait about some Ponzi scheme. Money doubling schemes in India are notorious for fooling people. But the author explains how you can invest in reliable schemes for long term and double your money. The rule of 72 is the best thumb rule to use. Very good advise and tips on how to double your money. There is risk in every thing we invest. My advise to those people who are claiming that you have savings money and would like to invest, don’t blindly believe in a person who claims that they will double your money or triple your money very fast. Do your own home work, ask what kind of investment schemes they have, understand the risk associated with them before you commit your savings. Mr.Khan kindly mailon ubsbank4@gmail.com will let you know the best investment. Dear friend i have around 25 lakhs to invest and really want this amount to get double please suggest me best and secure option. Mr.Khan I have a best plan for you if u intrested then contact me my whatsapp no is 7351336414 and my calling no is 9205831847.
start a street food bussiness….. I am an employee,with average income.But i have saved around 50k which i can invest for a period of 6 months.Please suggest the best way of getting max returns on this small saving. I want to invest lump sum amount of Rs. 3 lacs in share market for 10 years. Pls suggest the best way to maximise the return. Mrs. Swati. call me 9818641773 for best investment. Nice article. In mutual funds, one can invest in sector funds like Pharma funds where one can double their money in just 3-5 years. Yes these are high risk investments. Thanks Suresh Sir for your comment. Every market linked instruments are high risk investments but one should understand that no risk no reward and high risk high reward.